Age: 15 months. The girls were born 7 weeks early so around 13 months corrected. Favourite activity: Dancing, walking/running, clapping and throwing food on the floor! Emptying all their clothes of the shelves onto the floor and then climbing into the shelves also seems to be a favourite at the moment! A bit about mum: I’ve just started back at work part time (3 days a week) as an architect in Blackfriars and also doing some tutoring work as well. My work is dependent on projects so it’s a bit up and down. Dad works as a designer in Aldgate. Help or not? Lots of help from both sets of grand parents. We’re very fortunate that they share looking after the girls when I’m at work. I don’t think I would have been able to return to work if we didn’t have their help. James’ parents live in Teddington and mine in Southend so both relatively close by. My mum came and stated for the first week or so when the girls came home from hospital. 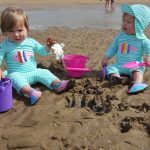 Quick tip for other twin/triplet mums: Try and get into a routine early on. Although the girls were in hospital for 2 weeks which was stressful we found that having them in a routine already was really helpful. Get a good buggy as well for all the nap walks! We’ve got a Donkey and it’s been the best thing we’ve bought. What advice would you give to your pe-pregnant self? Enjoy having time to yourself and don’t stress about things in the early days ! What advice would you give about sleep training? It’s really hard having sleepless nights in the beginning and I couldn’t do the thing of sleeping when they slept because they’d fall asleep on me and then wake up when I moved them! I found it difficult in the early days to get the girls to nap for more than 30 minutes so I used to take them out for walks as I found they would sleep for much longer. It got me out of the house and I got some exercise and fresh air. We used to swaddle the girls when they were very young and used the sleepy heads. We have also used dummies since they were in the neonatal unit. When they started rolling over and crawling we transitioned slowly over to the gro bags. I think they cried a little bit before going down but only for a few days and now they go down relatively easily. They are so tired by 6:30 that they go to sleep within about 5-10 mins. I am fully prepared that this can change at any time though! I think they started sleeping through until about 6 am once they moved out of the sleepy heads and could roll on their fronts. What advice would you give about breast/bottle feeding? Do what is best for you and your babies. I had a lot of support with tandem breast feeding on the neonatal unit so I did that alongside formula top ups. We also used to do bottle feeds during the night and I would express. I managed to do it for 7 months and I was really happy with that. I was very lucky that both girls latched on really well. The Tommee Tippee perfect prep machine is a must have and also a subscription to Netflix! Do you have any advice on weaning? Again do what is best for you and your babies. I started on purées as the girls were premature and then as they got older started to offer finger food. Now they are happy (most of the time!) trying lots of different things and are much happier feeding them selves. Do you have any advice on potty training? Haven’t started this yet and not looking forward to it! Best bargain? The Ikea high chairs are great. We got lots of things from friends, eBay and gumtree. Having to buy 2 of everything made us want to save as much money as possible! Best thing about having twins? I love seeing them interact with each other and Ruby as the oldest always looks after Poppy! They have such different personalities and I feel so lucky to have them both. They also have a ready made best friend. Funniest thing the twins have done? They are constantly doing things that make us laugh! Getting into the shelves is one of the funniest and the way that they always cuddle things. Ruby was trying to cuddle a stick yesterday! 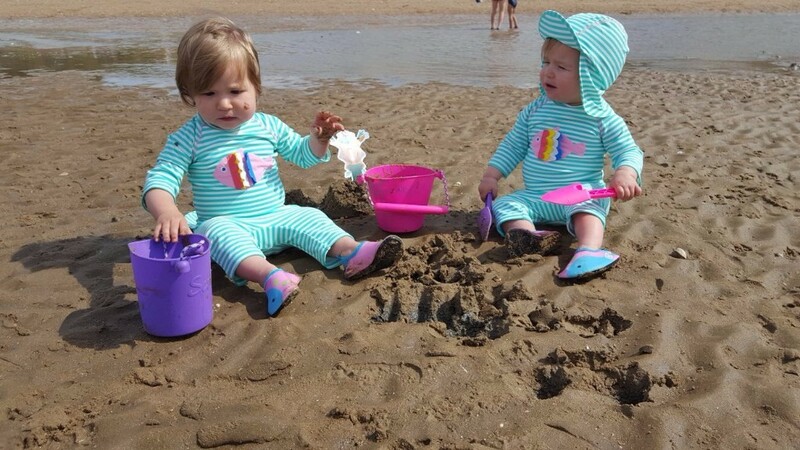 I love Twickenham Twins Club because….. everyone is in the same position, it is hard having two babies and I think only twin mum’s understand that. Having a baby in the the neonatal unit is hard too and no parent is prepared for that, twin mums are maybe slightly more prepared but it’s still a shock. It’s great to be able to talk to people who are in a similar situation.